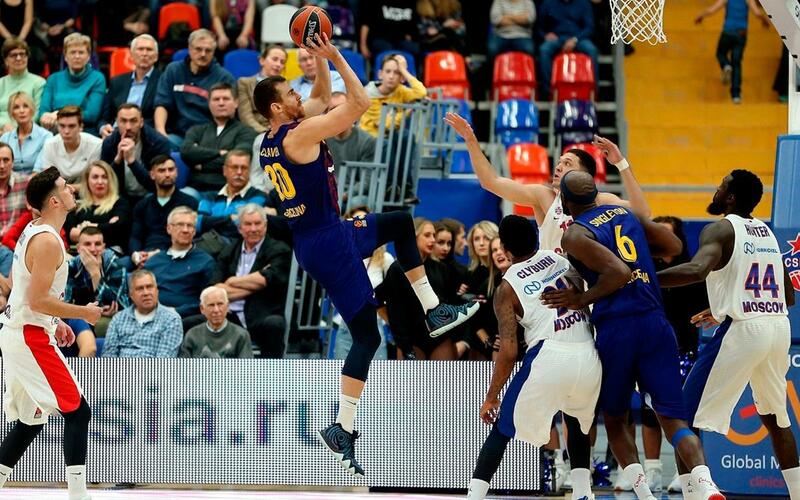 Barça Lassa were unable to carry their top domestic form onto the continental stage and lost their opening fixture of the Euroleague season. CSKA Moscow on the road was never going to be the easiest start to the campaign, and the Russians eventually took it 95-75. Kyle Kuric (15), Artem Pustovyi and Rolands Smits (the latter leaving early after taking a blow to the jaw) all made their tournament debuts on Thursday night, and Thomas Heurtel set a team record for assists (12), but despite a fine second half performance, the real damage had already been done before the interval. A tight game was tipped the CSKA way when Sergio Rodríguez entered the fray. Two threes from the Spaniards roused the Russian giant into action and their powerful counter-attack game soon saw them flying into the lead. They scored the first ten points of the second period and suddenly Barça were in big trouble at 31-17. It was downhill for most of the second period, which ended 51-29. The reaction came in the third period. More intense defending and points from the bench managed to close the gap to ten. With 4/7 in 3-pointers, Kuric played a key role in a period that Barça Lassa won by 11, but they still needed to win the fourth by the same margin to get anything out of this game. They gave it their best shot, but the Russians were in no mood for surprises and so the opening night of Euroleague basketball drew to a close.